A Stephens County High School student has been selected to participate in the U.S. Senate Page Program in Washington, DC. George Moore is a Junior at Stephens County High and is serving as a Senate page for the Spring semester, which runs from January 28 to June 7. Moore was appointed by U.S. 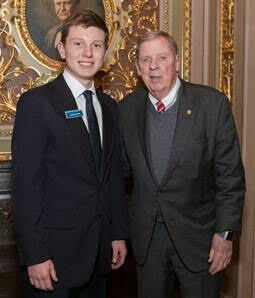 Senator Johnny Isakson. As Georgia’s senior Senator, Isakson is allowed to appoint one Senate page from Georgia per session, and there are typically four sessions per year – fall, spring, and two shorter sessions over the summer. The Senate Page Program is an enduring tradition dating back to 1829, when the first Senate page was appointed by Senator Daniel Webster. Senate pages are required to be high school juniors and at least age 16. Senate page duties include preparing the Senate chamber for sessions, delivering legislation and correspondence inside the Congressional compound and distributing statutes and amendments on the Senate floor. Senate pages who serve in the fall and spring must also attend academic classes each morning at the fully accredited U.S. Senate Page School before reporting for duty on the Senate floor. Moore maintains an above 4.0 grade point average at Stephens County High. He is a member of the Georgia 4-H board of directors where he previously served as senior board vice president for the Northeast District. Moore is also a member of the State School Superintendent’s Student Advisory Council. At school, Moore is parliamentarian of the Anchor Club and a member of the Fellowship of Christian Athletes leadership team, the Beta Club and the National Honor Society. He is also active in sports as a member of both the golf and cross country teams. Moore is a Boy Scout and is working to earn the rank of Eagle Scout. Moore has earned two citizenship awards thanks to his community service efforts, and he has previously participated in both the Georgia House Page program and the Georgia Senate Page program.